At the beginning of our mission we wondered if we would be able to actually come up with something to write about every week and have reserved a few things for a week with nothing, but they are still in reserve. 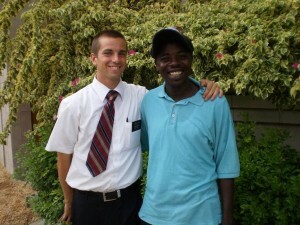 We had another week of coming from Togo, this time with Elder Olsen who was being transferred from Togo to Cote d’Ivoire. We cannot get Ivory Coast visas in Togo so we bring the Togo missionaries over to Benin so they can leave with the proper documents. We arrived here on Tuesday evening, got the application in on Wednesday but he was not able to leave until Friday. He stayed with us and we really enjoyed having him around. We were quite amused at him as he is somewhat small in stature but can eat like a football player. He is very polite and waits until we are finished, then with a little prodding he will finish up everything that is left on the table. Maybe he was just tired of rice and fish! He isn’t the only missionary that can eat a lot either. We have learned that when we invite all of them over, we have to emphasize quantity but it is fun to see them eat all they can of Soeur Black’s good food and they always appreciate it. We arrived in Cotonou just in time to go see Helene Briga before she was to leave for her six month military duty in Cote d’Ivoire. We have really grown to love their family over the past few months. It is so much fun to go to their home and feel the love that is so evident there. 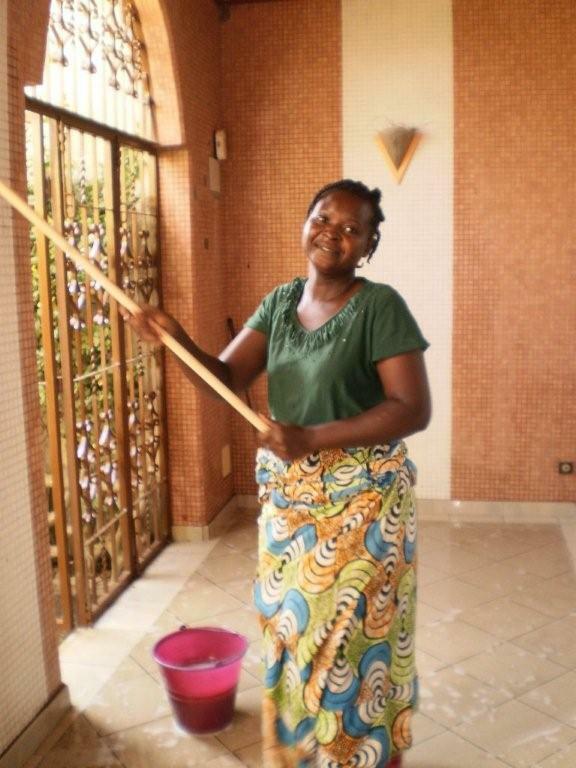 The girls, Maelle and Myla, greet us with open arms and it makes us feel like we are their Cotonou grandparents. When we see another family embrace the gospel of Jesus Christ so they can become an eternal family, we are reaping the rewards of being missionaries here in Africa. When she returns to her home, we will be at our home in Blanding. Already we are feeling sad about leaving the members here that we have grown to love as we know that we will probably not see them again. It was an eventful week for the Menontin Branch as the first sacrament meeting was held in their new chapel today. Of course, before the first sacrament meeting could be held it had to be cleaned and prepared. The members met on Wednesday to start the project and then again on Saturday, a lot of the branch was there making ready for Sunday. The building will be a great blessing to the members that live in that area as it will save many of them about a 6 kilometer ride to get to church. 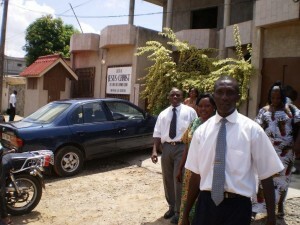 Church went very smoothly considering it was the first meetings in the new building. Afterwards, the Branch Presidency invited everyone to go visit the neighbors. We divided up into about 3 groups and visited the neighbors up and down the street for a hundred yards or so. It was quite interesting and we were well received. 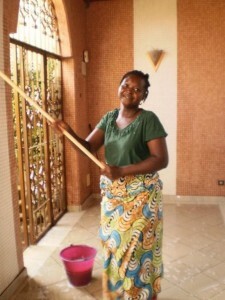 Soeur Black has been diligently working on the baptismal clothing project. Finding material and getting it sewed into decent clothing for 6 branches is a large enough project in itself but then you also need towels. Not having a Wal-Mart handy, we have made a couple of trips to Missebo market. I think we have talked about this before. Missebo and Dantokpa markets are a huge area of outdoor markets. We can send some pictures but probably can’t really describe them as there is nothing to compare them to at home. You about have to see for yourself. As near as I can tell, only one street divides the two markets and the area is probably a half mile or so square. You can buy anything or everything under the sun there, either new or used, but you have to find it first and bargain for the price you will pay. If you have a white face, the price always starts out higher. It is reputed to be the largest outdoor market in Africa although I understand almost every country has a market that claims that status. The only semblance of any order is that different items are grouped together in different areas of the marche. For example, as you enter one area of Missebo, the street is lined with shoes, shoes and more shoes. Past the shoes you find jeans and neck ties. The elders have found a brand of tie called Jaleta which is made in China and is virtually indestructible. For the big sum of 800 cfas or about $1.60, you can chose from a few thousand or more nice ties of every color under the rainbow. Of course, there is also an area of used ties which are also nice and which sell for 100 francs or about $.20 each. I think we have talked about them before. As you pass the shoes on the way to the ties you pass about 10 or 12 young men selling towels. 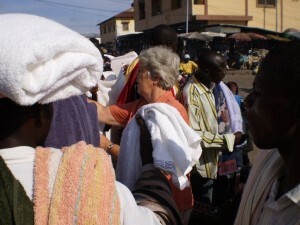 Soeur Black’s goal was to replace all of the stained, torn and bright colored baptismal towels with white ones. They sell used towels but they actually have some nice towels if you persevere. As soon as it is known you are a potential buyer, you are immediately swarmed with all of the sellers waving their towels in your face and wanting you to buy from them. 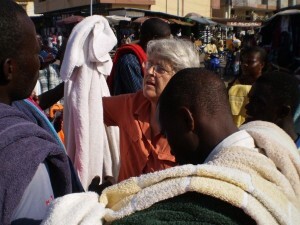 The first time we went there they started out with a 2500 cfa price but Soeur Black soon established the fact that she would pay no more than 1000 cfas ($2.00) per towel. She has learned what “trop cher” (to expensive) means in French and can say it convincingly. There is not any softness left. She drives a hard bargain! It was surprising how all of a sudden everyone had 1000 cfa towels! It kind of looked like piranhas in the Amazon River attacking their prey but Soeur Black managed to escape with the needed towels at the right price. One night this week we had a good old tropical thunderstorm with lightning and thunder all night. In the morning I was working on the computer when a lightning bolt knocked out all the electricity. Fortunately the computer has a good battery so I continued. The next lightning bolt nearly knocked us out. It must have hit the house as there was a loud pop and an arc of electricity shot out from somewhere near all our electronic things. (computer, printer etc. ). Luckily the computer was okay so I thought surely the printer, scanner or something else would be burned. After all was checked out it turned out the only casualty was our wireless Internet router. Even the current stabilizer was okay. We were very grateful that nothing else was damaged. Another of the blessings of Africa of which there are many.